Blind, disabled, and estranged from her family, 65-year-old Sajidha Begum has survived on a monthly pension check of 1,000 rupees (about $16) in Bangalore, India. In August, however, the Indian government sent a letter to the leprosy hospital where she’s lived for over 10 years saying her pension was being taken away unless it was linked to a card from Aadhaar, the country’s controversial biometric database. But since leprosy has taken Begum’s sight and fingers, she has no way of submitting the necessary fingerprints and iris scans—and no prospective solution as she awaits help. Aadhaar (meaning “foundation”) is India’s enormous, country-wide biometric database. Mandated by the Indian government, 1.17 billion people are in the system, which assigns 12-digit codes linked to iris scans and fingerprints to everyone living and working in the country. 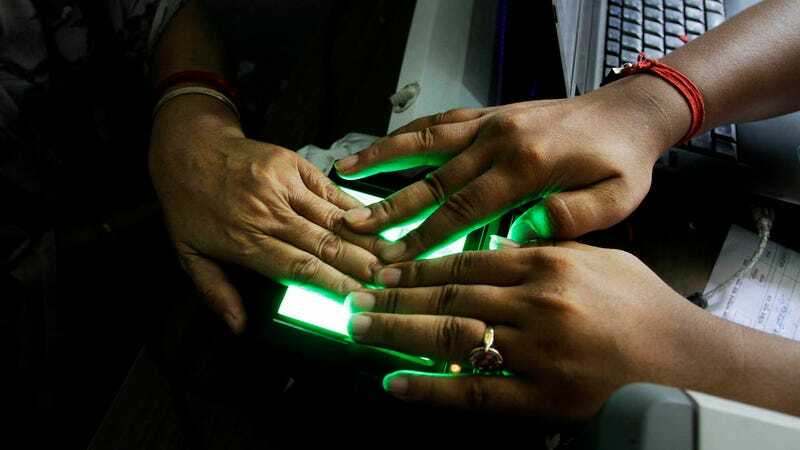 India began collecting biometric data for the system back in 2009 and many subsidies and entitlements, like pensions for the disabled and elderly, are credited to Aadhaar-linked bank accounts. Fingerprints and iris scans are mandatory for verification in the Aadhaar system, but Begum simply can’t provide them. She’s lost her hands, her sight, and her feet to leprosy. Dr Ayub Ali Zai, the administrative medical officer for the leprosy hospital where Begum has stayed for years, wrote a letter alongside The Indian Express to the Indian government asking for an exemption for her. They were denied. The World Health Organization estimates 200,000 people annually contract the disease in India each year. Dr. Zai told the Express that other patients in the hospital have the same problem. As amputees, they can’t provide biometrics and requests for exemptions are either ignored or denied outright. Aadhaar was built to establish a “digital identity” in an enormous nation with migrant workers who often don’t have ID.